Bob Shumaker was born in 1933 in New Castle, Pennsylvania. He enlisted in the U.S. Naval Reserve on June 26, 1951, and after attending Northwestern University for a year, he entered the U.S. Naval Academy in June 1952. He graduated and was commissioned an Ensign on June 1, 1956, and then completed flight training, earning his designation as a Naval Aviator in January 1958. LtJg Shumaker next completed Weapons School in May 1958, and F8U Crusader training with VF-174 at NAS Cecil Field, Florida, in October 1958, before serving as an F8U-1 Crusader pilot with VF-32 at NAS Cecil Field from October 1958 to June 1961. Lt Shumaker attended the Naval Postgraduate School at Monterey, California, to complete his Master's Degree in Aeronautical Engineering from June 1961 to June 1964, and then attended F-8 Replacement Air Group training with VF-124 at NAS Miramar, California, from June to September 1964. His next assignment was as an F-8 pilot with VF-154 at NAS Miramar, and deployed aboard the aircraft carrier USS Coral Sea (CV-43), from September 1964 until he was forced to eject over North Vietnam and was taken as a Prisoner of War on February 11, 1965. After spending 2,924 days in captivity, CDR Shumaker was released during Operation Homecoming on February 12, 1973. He was briefly hospitalized to recover from his injuries at Balboa Naval Hospital, California, from February to June 1973, and then attended the Naval Postgraduate School to complete his Master's degree and PhD in Electrical Engineering from June 1973 to June 1977. 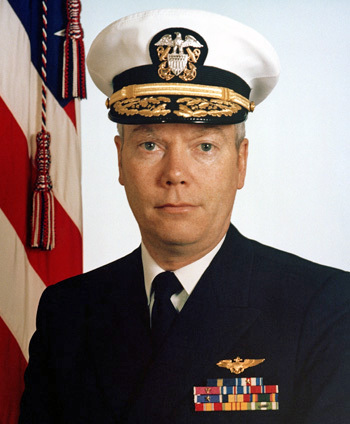 Adm Shumaker next served as a Project Manager for Smart Missiles with the Naval Air Systems Command at NAS Patuxent River, Maryland, from June 1977 to June 1983, followed by service as Superintendent of the Naval Postgraduate School from June 1983 to June 1986. His final assignment was as Director of the Tactical Air, Surface & Electronic Warfare Development Division in the Office of the Chief of Naval Operations at the Pentagon from June 1986 until his retirement from the Navy on February 1, 1988. After retiring from the Navy, Bob became an assistant dean at George Washington University and later became the associate dean of the Center for Aerospace Sciences at the University of North Dakota. Bob is married to the former Lorraine Shaw of Montreal, Quebec, Canada. In April 2011 he was presented with the Distinguished Graduate Award from the U.S. Naval Academy. For exceptionally meritorious service to the Government of the United States in a duty of great responsibility as a Prisoner of War in North Vietnam from January 1969 to January 1973. Although under constant surveillance during this period, he performed in an exemplary and Professional manner as a leader and staff advisor in duties involving highly classified material. Through his zealousness and ingenuity, he generated new ideas and improvised techniques greatly enhancing covert operations. Having volunteered in spite of great personal risk, he never wavered in his devotion and loyalty to the United States and his fellow prisoners. By his inspiring courage, exceptional skill, and resourcefulness, he reflected great credit upon himself and upheld the highest traditions of the Naval Service and the United States Armed Forces.